With a population of around 500. Farming is the main employment locally. The village is surrounded by beaches and wonderful views. The proximity to Northern Ireland often surprises visitors, but then again, it can disappear on a day when 'the mist rolls in from the sea'. The area is carpeted with wild flowers such as primroses, bluebells and thrift. Southend offers a varied opportunity to spot wildlife. Oyster catchers, herons, gannets etc are in abundance, and in spring the song of skylarks fills the air. Seals, dolphins, otters and deer may be spotted too. 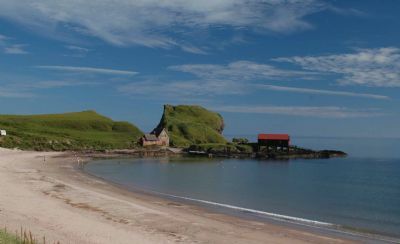 The Castle of Dunaverty stood on the precipitous headland jutting into the sea to the south of the village, past Dunaverty Golf course. First recorded in 712AD, captured by Haakon of Norway in 1263, sheltered Robert the Bruce in 1306, its history culminated in 300 men of the royalist garrison being massacred by the Covenanting army of Gen. David Leslie in 1647. The castle was rebuilt in 1542, attacked by the Earl of Sussex during his raid on Kintyre in 1558, and demolished in 1685, after the forfeiture of the Earl of Argyll. Today only slight traces of the walling remain. 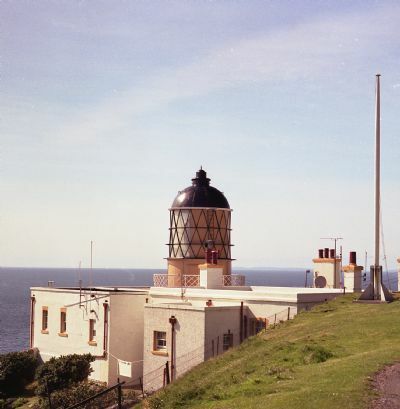 The site is easily approached by the road past Dunaverty Golf Course, throught the gates, then a fairly steep climb gives fantastic views west to Northern Ireland, east to Ailsa Craig and the Ayrshire Coast, with Sanda Island nearby. On the hill of Cnoc Araich are the remains of the largest iron hill fort in Kintyre. Access is from behind Southend Primary School. Follow the track leading to High Machrimore Farm. Caves at Carskiey car park are reputed to be haunted. A piper trying to reach Machrihanish got lost so the legent goes and at midnight can still be heard playing. Below the remains of the art deco Keil Hotel, lie the earlier ruins of Keil School, a private educational establishment for the sons of Argyll. It was founded when Sir William MacKinnon, who was born in Campbeltown, and made his fortune in East Africa donated to a trust which later bought Keil House. A catastrophic fire destroyed the building in February, 1924, relocated in Dumbarton, finally closing a few years ago. A statue of Sir William is located at Kinloch Park next to the new Community Centre. This area is renowned for watching sea life. The area in front of the cemetery is a favourite sunbathing spot for seals. Sometimes dolphins can be seen frolicking in the water and on really special occasions you may be lucky enough to spot the wild otters. Just before Achinhoan Head are some caves in which are the relics of St Ciaran, an Irish Saint who gave Campbeltown its original Gaelic name (Ceann Loch Cille Chiaran). He was a contemporary of St Columba one of group of early Christian missionaries who brought in a new religion to Argyll in the 6th century. The secular counterpart brought a new political system to the region - the Kingdom of Dalriada. These Irish immigrants also brought with them a new language Gaelic. Around 200BC the living style of the Iron Age people changed from hill-top forts of their ancestors to smaller family size structures. These were known as duns. One of the finest duns in Kintyre overlooks the mouth of Borgadale Water just off the road to the lighthouse at the Mull of Kintyre. It is 43ft (13m) in diameter and has a wall up to 13ft (4m) thick. The medieval parish church, which lies about a mile to the west of the village, was built in the 1320s under the patronage of the Lords of the Isles. The east end of the ruin dates from the 13th century the rest is later. Medieval grave-slabs lie inside the church carved in Kintyre, probably at Saddell Abbey. The graveyard dates from 1350-1500. 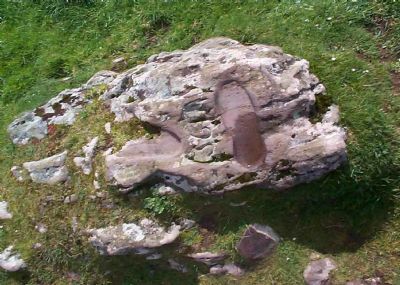 Overlooking the Chapel is a carved rock with two footprints known as St. Columba's Footprints. One is known to have been carved by a local stonemason in 1856 and the other (nearest Ireland) is ancient and may have been used in the inauguration of Kings who would promise to follow in the footsteps of their ancestors. Take the B842 south from Stewarton for 5 miles. Look for the sign on the left for Knockstapplemore chalets. Walk past Knockstapplemore and turn left up a forestry track and so onto the moor. This stone is over 3m tall and 1.5m wide. Standing stones can also be found on Dunaverty Golf Course. Dunaverty Bay is best for swimming etc. There are public toilets located at this beach. Brunerican, Macharioch, Keil and Carskiey(with car parking area) are wonderful for walking with spectacular views. The single track road south of Southend is twisty and steep, finishing in a car park 1 mile from the lighthouse. Well worth the hairpin bends and the climb back up, the walk to the lighthouse passes the site of the Chinook helicopter crash on 2 June 1994, a cairn, dedicated to those who lost their lives marks the spot. A clear day affords magnificent views across to the Antrim coast only 12 miles away and to Islay and Jura to the northwest. A mile north of the lighthouse, along a rough and overgrown track, lie the ruins of an abandoned township (Balmavicar). 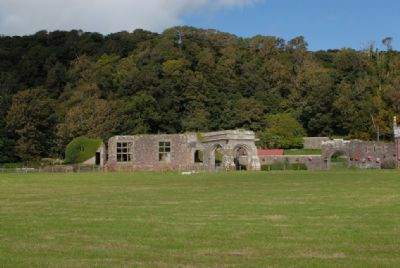 Many structures (houses and outbuildings) still exist, although deserted by 1779. Please obtain permission from the local farmer before proceeding to some of the sites mentioned above.